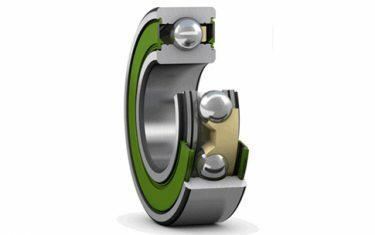 Coatings are utilized to improve bearing behavior in terms of such things as corrosion resistance, wear resistance, poor lubrication conditions, electrical insulation and many more. SKF has more than 20 years of experience in the field of coatings and has brought some successful products to the market. NoWear and INSOCOAT have become well-known trademarks. 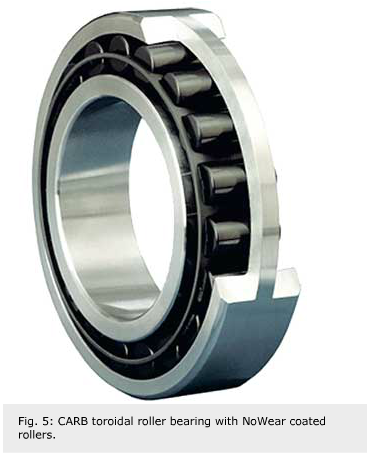 Coatings are in most cases utilized to improve the performance of bearings made of standard bearing steel. A coating of basic substrates with materials having the desired properties can significantly improve the properties of a bearing. Some coatings are deposited in very thin layers. 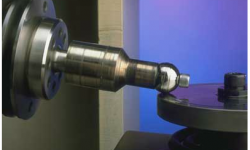 The advantage of coatings that are not more than a few microns thick (one micron equals 0.000039 inch) is that they enable the use of bearings with unchanged tolerances. 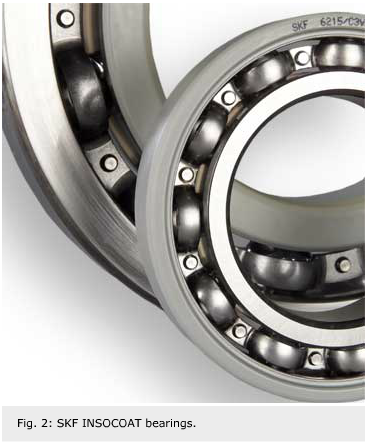 Standard bearings can be taken out of the production channel without the expense of changing the machine settings. 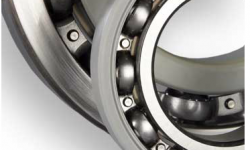 Most coatings give bearings a unique appearance, clearly distinct from conventional products. This can be used as a key marketing argument, as it underlines the ability to launch innovative products. 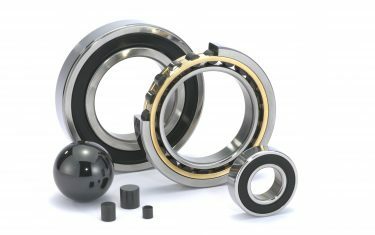 Coated bearings are often utilized to cover the gap between standard bearing steel and ceramic materials. For some applications ceramic rolling elements are a good solution but rather expensive; for others the geometry needed is not being produced. In that case the performance of standard bearings can be brought to the right level by applying coatings. 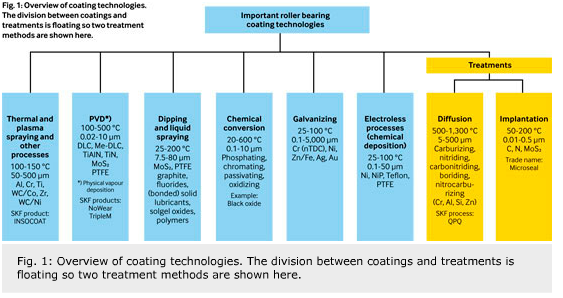 Figure 1 shows the coating technologies utilized by SKF. There is no sharp distinction between treatments and coatings. 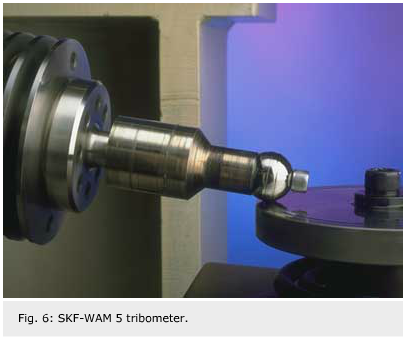 At SKF, case diffusion and implantation commonly belong to coatings. This overview shows very traditional technologies such as dipping and liquid spraying, chemical conversion, galvanizing and electroless processes, as well as more sophisticated technologies such as thermal spraying, physical vapor deposition (PVD), diffusion and implantation. The plasma spray process is basically the spraying of molten material onto a surface to provide a dense, even coating. Material in the form of powder is injected into a very-high-temperature plasma flame, where it is rapidly heated and accelerated to a high velocity. The hot material impacts on the substrate surface and rapidly cools, forming a coating. Plasma spraying has the advantage that materials with a very high melting point, such as Al2O3, can be used. The SKF trademark INSOCOAT stands for an electrically insulating Al2O3 coating that can withstand voltages of up to 3,000 V DC. INSOCOAT has been successful on the market for more than 20 years (fig. 2). PTFE coatings are utilized to prevent stick slip and fretting on bearing rings. Another application is the sliding contact area of maintenance-free spherical plain bearings. (fig. 3) and PTFE composite. The sinter bronze composite consists of a copper-plated steel backing that carries a thin (0.012 inch) sintered bronze layer. PTFE with MoS2 is filled into the pores of this lattice and forms an overlay, which is 10 to 30 µm thick. 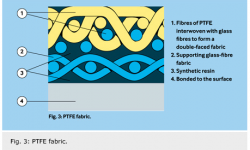 The more common material is PTFE fabric (fig. 3). 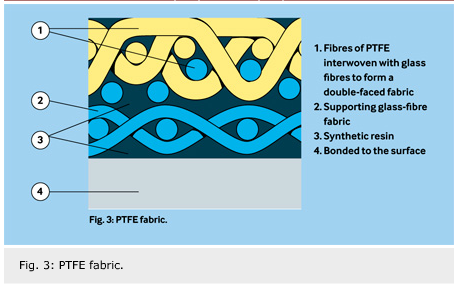 PTFE and glass fibers are woven to create a double-face fabric. A supporting fabric is made from pure glass fibers. Both fabrics are impregnated with synthetic resin and laminated to form the basic liner material of 0.024 inch average thickness. The material is bonded to the supporting surface in a special process. The PTFE composite is a glass-fiber reinforced polyamide with PTFE additives. The specific load and the temperature range are less than the two techniques mentioned before. The components are held by special fixtures and put in a heated vacuum chamber. The surfaces are bombarded by argon ions in order to clean them. A high negative potential is applied on the sputtering source. Gas discharges evaporate the coating material by hitting the source. A reactive gas transfers the evaporated coating. The sputtered particles precipitate on the target (fig. 4). The PVD process typically deposits very thin layers of metal and carbon. NoWear (fig. 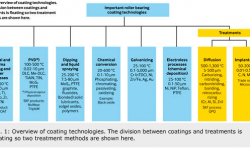 5) and metal mixed MoS2 coatings are representatives of this coating technology. Metallic salt in water dissolves to positive charged ions. This solution, called an “electrolyte” solution, involves the use of an electric current to reduce the metal ions to form solid metal. 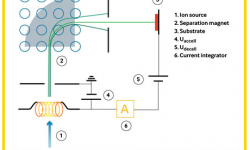 This process is commonly referred to as electroplating or electrochemical deposition. Ni, Cr, Zn/Fe, Ag and Au are deposited electrochemically; nTDC (nodular Thin Dense Chromium) is a corrosion-resistant coating with a low coefficient of friction. Applied by a special cold-sprayed process, micro particles of solid lubricant penetrate the material to a depth of a few microns and are encrusted there. 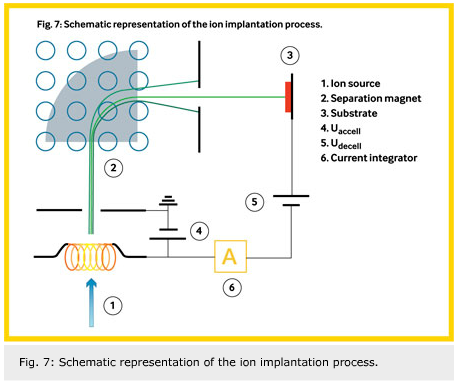 Ion implantation equipment typically consists of an ion source where ions of the desired element are produced. The ions are electrostatically accelerated and shot against the target (fig. 7). A process for implantation by MoS2 is called Microseal, a process by Microseal Industries Inc. (SKF designation suffix VL049). It is used to reduce friction and wear. In some cases conventional measurement methods are not applicable to determine coating properties. The thin layers and different material combinations render conventional measurements unusable. To solve this problem, new measurement methods have been developed. The main elements of the apparatus are the independently rotating ball and disc (fig. 6). The adjustment of speed produces rolling contact or slip in the contact zone. The friction coefficient is determined in the following way: µ=Fr/Fn, where Fr = friction force and Fn = normal force. The wear coefficient is measured by the time it takes for the coating to be worn through. 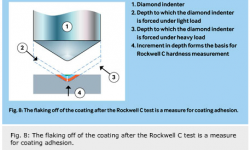 The removal of the coating is indicated by a changed friction coefficient. The hardness of thin layers is measured by the indentation test. The diagonal of a pyramid-shaped impression is the basis for calculating the hardness with the Vickers formulars. It is important that the penetration does not exceed 10% of the coating thickness; otherwise the result is influenced by the substrate material. 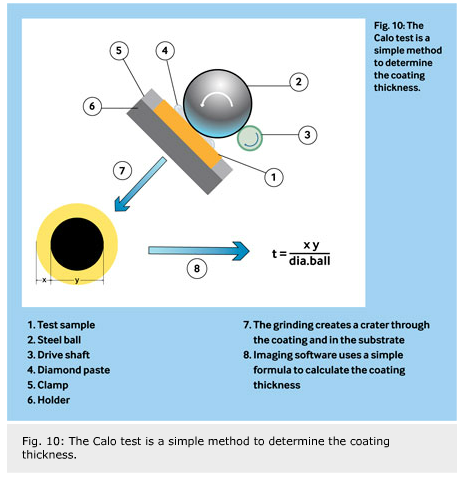 A standard for measuring the microhardness of thin coatings is not available. 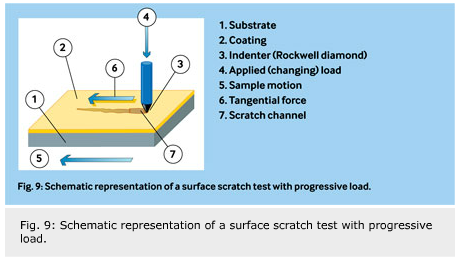 The Rockwell C test and the surface scratch test are common test methods. 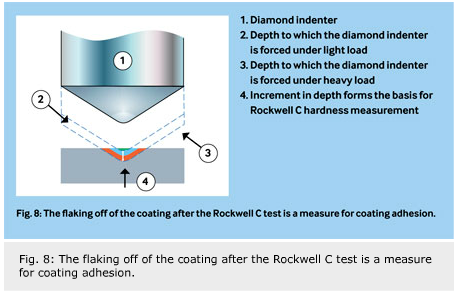 The adhesion test, by means of the Rockwell C test VDI 3824, is performed in the same way as a standard Rockwell C hardness test (fig. 8). The size and type of the coating chipped off around and in the impression, is investigated by using an optical microscope and comparing the chips to a series of pictures. 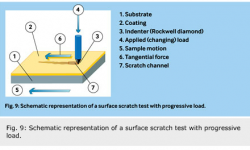 Another method is the surface scratch test VDI 3824. The surface of the specimen is scratched by a Rockwell cone (fig. 9). The load on the indenter is constantly increased. The scratch track is inspected under the microscope to determine the critical load. The distance between the start of the track and the failure event indicates the critical load. The critical load is achieved when the coating starts flaking off. A non-destructive method is the X-ray fluorescent (XRF) analysis VDI 3824. The surface is exposed to X-ray radiation. The intensity of X-ray fluorescence lines of the coating are used as a measure of the coating thickness. 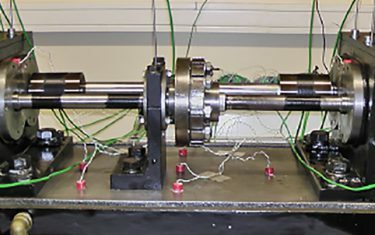 The light-optical microscope measurements on the metallographic spherical-ground section, also called the Calo test (fig. 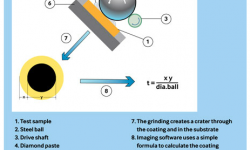 10), are destructive and are carried out as follows: A spherical shape is ground down to the substrate surface by means of a ball and diamond paste. Measurement on the crater makes it possible to calculate the coating thickness. 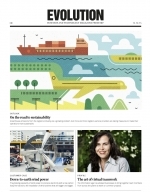 This article shows that some coatings have already been successfully introduced to the market. NoWear, for example, is clearly positioned on the market with the attri-butes of smearing prevention and friction reduction. Further coating development will be undertaken with a clear focus on function. This means the aligning of further development work with new products that feature added value for specific applications and segments. An all-around coating solving a broad variety of problems is probably not going to be found. To expand the coating business it is important to consider coatings as more than simply an emergency solution after a bearing has failed. 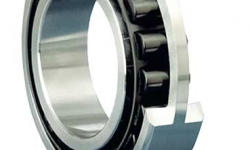 It is important to pay attention to coating technologies very early in the development process to prevent malfunctioning of bearings proactively. This procedure could be the basis for a stable growth of this business. There are already a large number of coatings available on the market. 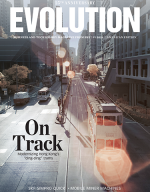 Matching the needs of the customer is key for succeeding with further development efforts.